Opening a MyWallet account with RCBC Savings Bank is something you should consider if you are looking for an easy and hassle-free banking experience. What’s great about MyWallet is that it has no minimum maintaining balance. Furthermore, you can use it for shopping online, for cash withdrawals, for paying your bills, and for transferring funds from various sources such as PayPal. That said, if you are an online worker or entrepreneur who receives funds from PayPal, this is an account that would fit perfectly with your work or business. 1. It doesn’t have a maintaining balance. It’s even much lower compared to the maintaining balance of the EastWest Basic Savings Account which is 100 pesos. That said, when it comes to maintaining balance, RCBC wins over EastWest. 2. Availing of the card is easy and hassle-free because the bank has very minimal requirements. All you need to do is present a valid ID then fill up the enrolment or application form. You will even get the card on the same day that you applied. This is if the branch you enrolled in has a card printer. If it doesn’t have a printer, you will have to wait from 3 to 5 banking days. Remember that it’s “banking days” which means you will have to wait longer if holidays and weekends follow the day you applied. 3. The card is very affordable. All you need is 100 pesos to open your MyWallet account. 4. The card has no expiry date. That’s right, you don’t have to apply for renewals every few years. However, it’s worth mentioning here that you should actively use the card. Because if you don’t use the card for 12 months, the bank will start charging an inactivity fee of 200 pesos per month. 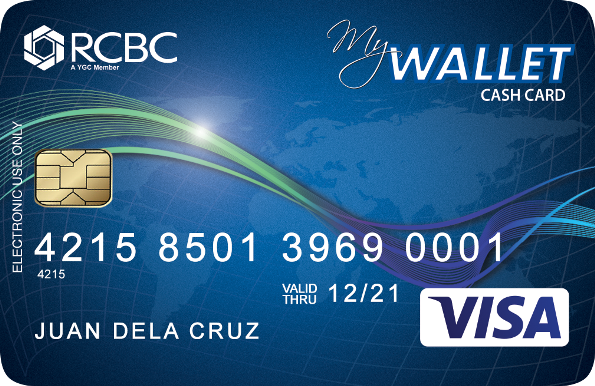 If you have a valid ID like any of those mentioned above, you can go directly to a branch of RCBC and enroll for a MyWallet card account. Just follow the instructions by the bank officer.